It arrived this morning. I've only had time to watch the first act, but, but ... what I saw and heard was stupendous. Sarah Connolly as Caesar is astonishing, but Danielle de Niese as Cleopatra is probably the most extraordinary operatic phenomenon I've ever seen and heard. The sheer eroticism of her performance - not just the singing, but the dancing too - is truly compelling; and just generally, the choreography of this production - the way in which the characters dispose themselves and move around the stage - is so intriguing that it's possible to miss major bits of plot just by being absorbed in the side issues. I can see this is a performance to go back to again and again, if only to keep picking up on details that have been missed on previous watchings. It took me about 15 minutes to get used to the idea of seeing Romans in C19th costume, but my uneasiness changed to delight as I realised how this opened up the expressive capabilities of the production. Cleopatra's performance covers all sorts of ground, stretching from Egyptian schemer, to Victorian lady-on-the-make, to twentieth century vamp, and she makes all sorts of little references and gestures that throw forwards to the present, in a way that becomes possible only because of the ambiguities of the temporal setting. And then there's the music. I'm relatively new to Handel opera, and completely new to this one in particular - but my goodness, what an introduction. And two more discs to go!! Gaston - I hope you read this. Feel free to polish your Talk Classical Helper's badge. You've done me a brilliant good turn, here. Last edited by Elgarian; Feb-28-2009 at 17:56. Thanks for the nice words, Alan. I agree with everything you say about this set. 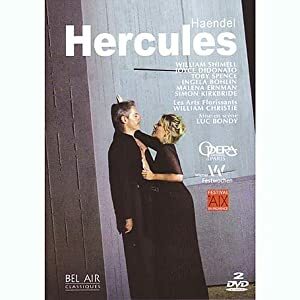 It's one of my favorite opera DVD's by any composer. It's as close to perfection as it gets. 1. There's constant anachronistic jarring between the baroque character of the music, and the 1930s feel of the setting, sets, and costumes. One of the most powerful properties of great art of any kind is its unity, leading to an impression of the whole being greater than the sum of its parts. But how can you achieve unity of this kind when what you're seeing is so at odds with what you're hearing? This isn't peculiar to this production of course - and you could point at the great Glyndebourne Giulio Cesare and say: 'why not complain similarly about this?' To which I'd reply: 'because the performances are so vital and inspired in so many ways that the anachronism seems less important.' The point is - I enjoy Giulio Cesare in spite of its anachronistic production; not because of it. 2. Visually, it's extremely dull. The production is effectively monochrome. Why? What advantage is there in robbing us of colour? This is opera, not film noir. 3. I can't feel any sympathy with any of the characters. I don't believe in them. I don't care about them. They're just so much cardboard. So, there's one act still to go; but watching it seems more like a duty (after all, I spent money on this so I feel I ought to see it through to the bitter end). 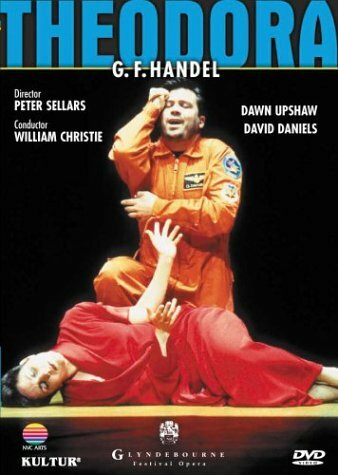 This is one of those productions that used to make me think it simply wasn't worthwhile watching opera on DVD. What a sharp contrast this makes with watching Opera North live, last night: Werther, with Alice Coote as Charlotte. She was recovering from swine flu, but still she was entirely believable, and the opera thoroughly engrossing. The sets were simple, almost minimal, but superbly effective, and the shock ending was presented with nothing short of brilliance. Charlotte and the dying Werther were on a kind of raised platform (with nothing but Werther's bed on it), surrounded by darkness. As Werther died, the platform began very slowly to twist and move away towards the back of the stage into the darkness - so slowly that at first it wasn't possible to register exactly what was happening; one just knew that something frighteningly disorientating was going on that was affecting one's perception of the whole world/stage. The last we saw as the music ended, and the platform moved into darkness, was Charlotte reaching for the dropped pistol. Terrifying, dreadful, heartbreaking. But tremendous art. There's constant anachronistic jarring between the baroque character of the music, and the 1930s feel of the setting, sets, and costumes. One of the most powerful properties of great art of any kind is its unity, leading to an impression of the whole being greater than the sum of its parts. But how can you achieve unity of this kind when what you're seeing is so at odds with what you're hearing? This isn't peculiar to this production of course - and you could point at the great Glyndebourne Giulio Cesare and say: 'why not complain similarly about this?' To which I'd reply: 'because the performances are so vital and inspired in so many ways that the anachronism seems less important.' The point is - I enjoy Giulio Cesare in spite of its anachronistic production; not because of it. Yes, I take your point that there doesn't seem to be any connection between the time period chosen and the music/action/plot. I was quite puzzled myself why they had chosen this setting, and the only thing I could come up with was that it allowed for very stylised and exaggerated actions and the director might have felt that there was some parallels in that sense with baroque staging . But it didn't really come off and maybe this over stylised way of acting also contributed to your feeling of disengagement. On the other hand for me the Giulio Cesare staging enhances the experience - there seem to me to be clear parallels between Roman and British "colonialism" and in fact the modern take makes this more salient to me as it speaks in more familiar idiom - for example Cornelia's disdain for the "vile Egyptian" seemed very Passage to India. Another example where this updating worked well in my view was Jonathan Miller's 50s Mafioso Rigoletto - The Duke with his henchmen, Rigoletto as the barman, obsessively protecting his daughter etc. If you were directing Rodelinda, what would you do - stage it in Baroque costume, or some kind of "ancient" costume (like Savall's L'Orfeo) or what? I must confess I'm going to recommend a DVD I haven't actually bought (yet) but been able to watch in its entirety on youtube. Since I am a kind of countertenor geek I was of course very impressed by David Daniels who, at least to my inexperienced ears, sounded flawless all the way. I also particularly enjoyed Richard Croft as I had seen him in the staged version of Messiah, also on youtube, earlier this year without knowing who he was. I also found every aria to be just beautiful and now Theodora has become my favourite of Händel's works. ...that said, what is it about the productions William Christie conducts; they all seem to involve a kind of elaborate arm choreography.. This arrived today, and I didn't have much time, but I couldn't resist a sneak preview of the first quarter of an hour. Oh I am going to enjoy this. The sets are very interesting - though they're quasi-abstract, right from the start there's a convincing Arcadian 'feeling' present. The combination of ballet and opera (each singer having a dancing counterpart, providing a kind of danced commentary on the unfolding drama) looks very beautiful and expressive. Much though I love Danielle de Niese, she somehow doesn't strike me as an ideal Galatea, being rather too 'earthy' perhaps - but maybe I'll be persuaded as the production unfolds. And in any case, I don't think there's any risk of my not enjoying this. 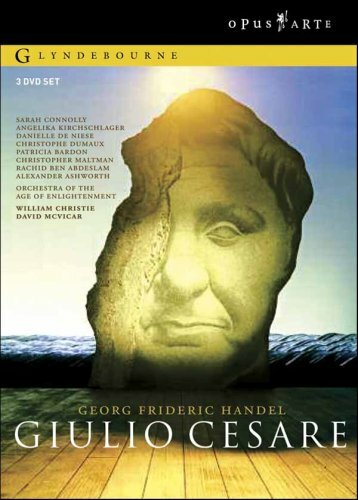 This is my second favourite Handel DVD (after the Glyndebourne Giulio Cesare). What did you think of it, Grosse Fugue? Very good. Joyce Didonato wa fantastic, expressed the pain and craziness of Dejanira really well. Sometimes the actions didn't fit completely but it is an oratorio technically. Another example of how baroque and William Christie really go together. That Giulio Cesare is high on my list of must buys. That list never seems to get shorter no matter how many DVD's I buy. Funny that . Very good. Joyce Didonato wa fantastic, expressed the pain and craziness of Dejanira really well. Sometimes the actions didn't fit completely but it is an oratorio technically. Another example of how baroque and William Christie really go together. That Giulio Cesare is high on my list of must buys. 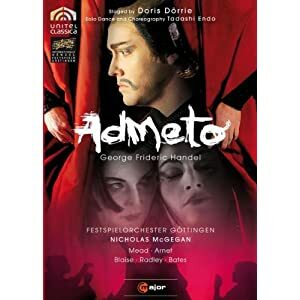 Yes I thought Didonato was impressive (that aria "Where shall I fly" makes my hair stand on end) although the rest of the cast was pretty good (Shimmell a bit gravelly these days, I remember when he was a hot young Don Giovanni in the 80s). 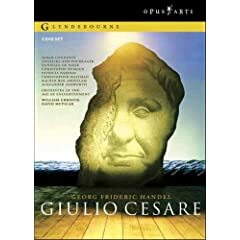 That Giulio Cesare is high on my list of must buys. That list never seems to get shorter no matter how many DVD's I buy. Funny that . Tell me about it. I just discovered ArkivMusic's alphabetical list of opera DVDs and that has made the problem even worse! The main problem is storage - I wish you could get DVD storage wallets which are big enough to take the leaflets so I could get rid of the plastic cases. 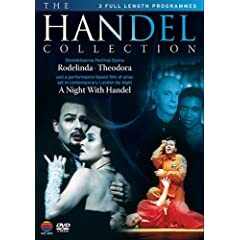 I'm very happy I ended up getting this and it has gone straight to my list of favourite Handel DVDs. The restricted and stylised world of samurai Japan and the use of Butoh dancers illustrate the psychological aspects of the work very effectively, and it's very beautiful. Check it out on Youtube. Watched this favorite again. I suppose everyone here already has this. If not, you don't know what you're missing. Yes I do, it's pretty good. I just wish Danielle de Niese could sing. Her voice is nice enough but has no projection, it's a pretty small voice in my opinion. She looks very good, though. Watched this favorite again. I suppose everyone here already has this. If not, you don't know what you're missing. For me it's better than pretty good. 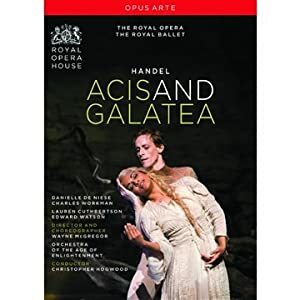 It easily makes my top ten, maybe even top five of favorite opera DVD's. De Niese is maybe not the best singer in the world, but she's nonetheless good in my opinion, and as a 'performer' she's great. It helps that she looks great, but she's playing Cleopatra who's supposed to look great. I mean, it also helps when the guy playing Scarpia in Tosca looks like a jerk.